There are many standard items which go on a copyright page. One thing you may want to consider adding is a printer's key. What is a printer's key, and how does it help you? First, the history. Back in the old days, when they wanted to print a book they had to create it in a very laborious manner. They would take a wooden grid. Then they would take tiny metal letters and place them one by one into this grid. They would literally build the entire book letter by letter. Once they had a full page done, they would ink the letters and then press that grid against a piece of paper. That is how a page was made. As you might imagine, it would take weeks and weeks to lay out a single book. It makes one appreciate how easy we have it in modern times! So with books being manually created, letter by letter, the potential for typos was fairly large. If a revision was made - maybe adding an extra "r" that was somehow left out - the publishers wanted to have a way to track which version the book was. But at the same time they wanted to make it incredibly easy to update the book to show what new version it was. Anything complicated could just lead to more mistakes. So they didn't want someone to have to remove a number "1" and put in a number "2" instead. Something could easily go wrong in that process. The person doing the job could grab a "7" by mistake. So this is where a printer's key comes in. When the book was made the very first time, it was assumed that there could be at least 10 runs of this book while problems were fixed or more copies were ordered. 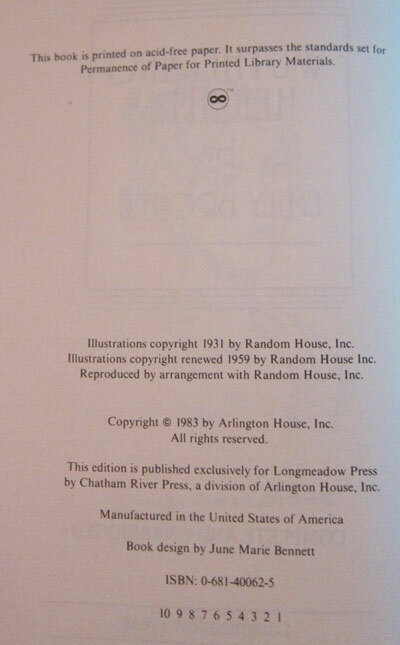 So right from the beginning they started the book with the numbers 1 through 10 on the copyright page. So here's an example of my copy of Wuthering Heights by Emily Bronte. You can see at the bottom of the copyright page that it shows the number 10 9 8 7 6 5 4 3 2 1 in a row. So since there is a 1 in that list, it means it's the very first run. When the printer went to make a second run, they would REMOVE the one. Now with 2 being the lowest number on the list, it would mean it was the second run. If the printer's assistant only had to remove one number, the chance of screwing that up would be slim. So this was the easiest possible change that would be meaningful. The numbers are listed backwards so they are always left-aligned. That way it always looks neat and orderly even as they get to versions 9 and 10. Sometimes they want to have the numbers centered, rather than left aligned. In those cases they might show the numbers a 1 3 5 7 9 10 8 6 4 2. In that system, as the numbers are removed from either end over time the remaining numbers stay centered. In modern times, of course, we don't use little metal letters. So why do we care about a printer's key? The end purpose of a printer's key is still quite valid - to keep track of what version your book is. If anything, this is even more important in modern times than it was back in the days of metal type. 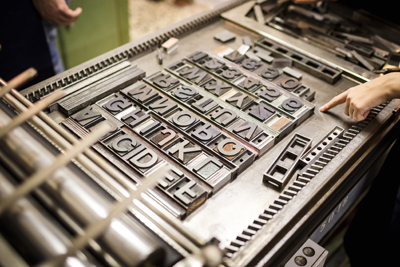 In metal type days, books would rarely be updated. It was a royal pain to update them and it was only done when necessary. In modern times, with print on demand, we could literally update our book every day. If we found a new typo one a week, we could update the book every week to fix the latest typo we'd found and post the new version. Then, when you find a book lying around your house, you want to know if it was that version 1 with 200 typos, or if it was version 30 with only a few typos. That way when a friend asks to borrow your book you can be sure to give them the better version. But how will you know what version your book is just by glancing at it? Will you keep track of when you fixed which typos and go digging through the book to see which typos it still has in it? So the answer is to put a version number on your copyright page. You can certainly style it in the printers key format. You can start out putting 10 9 8 7 6 5 4 3 2 1 on your first version, change that to 10 9 8 7 6 5 4 3 2 on the second version, and so on. When you get to version 11 you simply up the numbers, changing them to 20 19 18 17 16 15 14 13 12 11. Alternately, you could simply put a standalone number on the last line of your copyright page. So your first version you just have "1" at the bottom of the page. On the second version you have a "2". That way you always know exactly what version this book is. If someone emails you about their Kindle book they are reading, you can ask them which version and, if they're on an old one, you can suggest they update it. So in general I highly recommend you have a printer's key of some sort on every book you publish! It will help you keep track of print versions and ebook versions.